The UWAC branch affiliated with the Ukrainian Orthodox Church in Ottawa was first organized in February 1952, about two years after the founding of the parish, and was originally known as the St. Sophia Branch. The first executive of this branch consisted of the following: Miroslava Dacour – President; Ivanna Petrivska – Vice President; Iryna Mushka – Secretary; I. Shandro – English Correspondence Secretary; Pearl Krokosh – Treasurer; Pauline Dorofi, Alice Kubishewsky and Tatiana Chala – Audit Comittee; and Pauline Dorofi – Hospitality Manager. After a number of years, the fledgling organization encountered some difficulties and a declining membership. 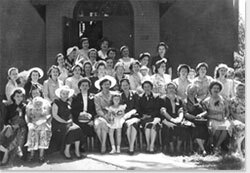 At that time the sisterhood that was also active in the parish assumed the responsibilities and continued the work of the women's group for several years. 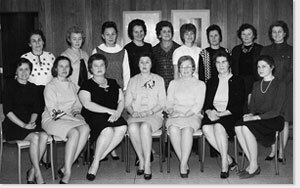 On February 14, 1960 an organizational meeting of a group of women took place and the current Lesia Ukrainka Branch was formally established. The first executive of the Lesia Ukrainka Branch was composed of the following: Anastasia Trishchuk – President; Maria Mack – Vice President; Doreen Keir – Secretary; Marie Kishchuk – Assistant Secretary; Pearl Krokosh – Treasurer. Present at the founding meeting were Olena Darcovich, G. Havreliak, Adele Kereliuk, Natalia Kodak, Iryna Loshney, Maria Mandziuk, Katherine Mosichuk, Iryna Mushka, Myroslava Mychalkov, Mary Tokaryk, Luba Podolsky, Tatiana Chala, Pauline Dorofi, Alice Kubishewsky, Ivanna Petrivsky and Maria Kischuk.The annual membership fee at that time was $2.00. During the early years, the young and enthusiastic members' priorities consisted of social and cultural programs to maintain the growing parish and preserve Ukrainian cultural traditions. Several committees were created to address programming, social events and cultural activities including arts and crafts. Their first projects included preparing and serving parish dinners, sales of used clothing and conducting short courses in the art of Easter egg writing (pysanky), traditional baking and embroidery, some of which were demonstrated on local television programs. Several members attended weaving courses in Banff, Alberta and later shared their newly acquired skills with the other members as well as parishioners. Activities grew to include celebrations of Ukrainian literature (Sviato Knyzhky), embroidery evenings, membership receptions, and seasonal events such as St. Nicholas concerts for the children. Initiatives to embroider table covers and acquire decorative items for the beautification of the church were organized. Members also became active as a social service by visiting the sick and housebound. Over time the roles, responsibilities and activities of the Women`s Association expanded. Through the years the members also took part in a variety of other church activities, including the church choir, the parish executives and various event committees. 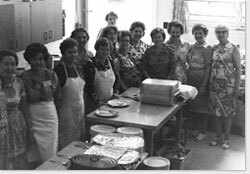 To this day, the Women's Association organizes, prepares and serves three major parish dinners every year – the Eve of the Feast of Jordan (January 18), Spilne Sviachene (the first Sunday after Ukrainian Easter), and Khramove Sviato (Parish Feast Day in early September). The top priority of the Women's Association is to support the parish in any way that is required, including both financially and physically. From the very beginning, this has included fundraising for the actual construction of the hall and the Cathedral buildings. There have been various fundraising activities such as fashion shows and teas, bingos, and, of course, the always popular bazaars. The Women's Association organizes two bazaars every year, one during the pre-Easter season and a second before Christmas. In 1989, as a result of increased public relations efforts within the local Ottawa community, the bazaar attendance increased significantly. Since then, the Ukrainian Orthodox Church bazaar is eagerly awaited in the Ottawa community with people waiting in lines to enjoy the traditional Ukrainian cuisine and buy savoury and sweet baked goods prepared by the Women's Association with the help of parishioners. Several months of preparation are required for each bazaar, and as a result these bazaars are very successful, consistently attracting both the Ukrainian and local Ottawa communities as a whole. The Church bazaars have been the primary source of fundraising by the Women's Association. A majority of these funds have been donated to the parish for major repairs and beautification projects. 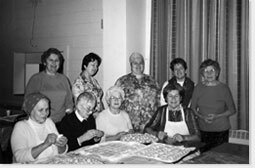 One of the most significant of these was in 1989, on the 30th anniversary of the Lesia Ukrainka Branch, when the Women's Association funded the expansion, renovation and re-equipping of a new kitchen at the church following massive fundraising efforts. Generations of dedicated, talented and hardworking women have ensured that the church interior has always been well-maintained and beautifully decorated. To this day, they have made sure that the church is always properly adorned, carefully reflecting the seasonal and religious occasions with appropriate rushnyky (embroidered cloths), church banners and complete sets of embroidered coverings for the Altar and tables. The Women's Association has also funded and arranged for the provision of numerous sets of priest vestments. Every year for Good Friday the Women's Association collects donations to adorn the platform holding the Holy Shroud with a multitude of flowers. Over the course of a year, the Altar and tables in the Church are covered with intricately embroidered cloths that were designed and made by many women over the years – Orysia Sztepa, Olga Bokhenko, Mrs. Monuk, Anne Kosovan, and Maria Kostiuk. Mrs. Monuk embroidered the cloth depicting two colourful birds that is typically draped over the podium that serves for the reading of the Holy Gospel, as well as a Taras Shevchenko rushnyk. Iryna Mushka, Maria Holuk and others sewed several sets of curtains for the church hall and robes for the Altar boys. In addition to sewing the backdrop curtains for the stage with Maria Holuk, Halyna Zelem sewed purple cloths to cover the Altar and tables during the Great Lent. Embroidery that is used at Easter was done by Orysia Sztepa and Olga Bokhenko, while the Christmas seasonal embroidery was done by Anna Kosovan. Over the past 19 years, Maria Kostiuk embroidered two sets of banners depicting Jesus Christ, the Blessed Virgin Mary, Knyahinya Olha and Knyaz Volodymyr; vestments that were presented to Fr. Jaroslav Buciora; an entire set of covers for the tables in the Altar; as well as additional covers to complete existing sets. Maria Kostiuk was honoured by MP Mac Harb in 1999 for her work and dedication to creating the embroidered items for our church. As in many other Canadian cities with a Ukrainian population, a Ukrainian school was established within the parish. In Ottawa, the parish's Saturday morning Ukrainian school was established in 1952. Over the years, members of the Women's Association took on the role of teachers for these classes. The traditional Ukrainian love of song and dance was transferred to the children through organized choirs and dancing groups, and talented individuals stepped in to provide musical accompaniment as the children performed at the annual concerts to celebrate St. Nicholas, Taras Shevchenko and Mother's Day. These schools were a fundamental cornerstone of the parish and the Ukrainian community. The parish's Ukrainian school no longer exists but all former teachers, students and families have fond memories of those special days. 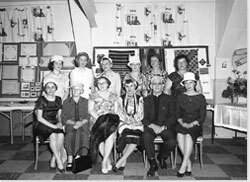 In 1962, a branch of the Ukrainian Youth Association of Canada (CYMK) was organized at the parish. With the ongoing support of the Women's Association - both financially and through the efforts of their members - the youth organization remained a focus of youth activity until the late 1970s, and then in later decades with the needs of each new generation. In an effort to give the parish youth a grounding in the Ukrainian Orthodox religion, the Women's Association financially supported the establishment and operations of Sunday school with the help of a number of successive Dobrodiyky and high school girls from the parish. Over the years, the Women's Association also gladly provided financial assistance to the youth of the parish, supporting their participation as delegates to national conventions and attendance at Ukrainian summer camps. 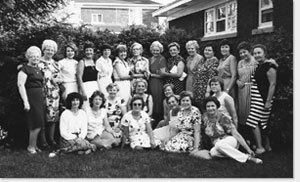 From the very beginning, the Women's Association was active outside the Church both with other Ukrainian activities and organizations such as the Ukrainian Canadian Congress (UCC), as well as with the mainstream community. In the early years, the branch worked with the Canadian Red Cross, the Citizenship Council and the Council of Women where the Ukrainian perspective was presented before other Canadian organizations. Delegates from the Lesia Ukrainka Branch participated in provincial and national conventions as well as on regional executives of UWAC. It also celebrated the UWAC's anniversaries, including the 70th anniversary in 1996 on which occasion Ambassador Volodymyr Furkalo of the Embassy of Ukraine in Canada and other Embassy officials were invited to a special luncheon hosted in the church hall by the members of the Lesia Ukrainka Branch. For many years the Women's Association helped needy Ukrainians in South America and the Ukrainian Orthodox Church in Poland. With the declaration of Ukrainian independence in 1991, the Women's Association's efforts were redirected to helping people in various regions in Ukraine by gathering and shipping used clothing, special collections of school supplies and medical supplies. Over the years, the Women's Association has also made donations to publications such as Promin (the UWAC's bilingual journal), Ukrainian Voice (Canadian-Ukrainian newspaper) and Visnyk/the Herald (newspaper of the Ukrainian Orthodox Church of Canada), the Ukrainian Museum of Canada in Saskatoon, Saskatchewan, St. Andrew's College in Winnipeg, Manitoba, and the Children of Chernobyl Foundation. Sponsored and organized the Flowers of the Bible art show and sale with Edmonton artist Larisa Sembaliuk-Cheladyn in attendance (2000). The members of the Lesia Ukrainka Branch have generously dedicated many years of service to the Assumption of the Blessed Virgin Ukrainian Orthodox Cathedral and to Ukrainian community life in Ottawa. Their faith and love of Ukrainian traditions united them and made them strong, and they shared their strength with our church and our community. Almost 60 years later the Women's Association continues its efforts to support church projects and activities that preserve and promote the Ukrainian culture, language, customs and our religious heritage in our nation's capital.